The cancer patient who was stopped by the government forces from moving in an ambulance on the Sringar-Jammu highway during the movement of CRPF convoy last Wednesday died. A video of the incident surfaced on social media in which a CRPF man is seen denying permission to the ambulance from moving ahead despite the patient and attendants onboard. In the video clip, the CRPF man is seen stopping the ambulance while signaling the government forces vehicles, coming from opposite direction to move. The CRPF man on the highway duty then signals the driver to park the ambulance on the side of the highway which he does. 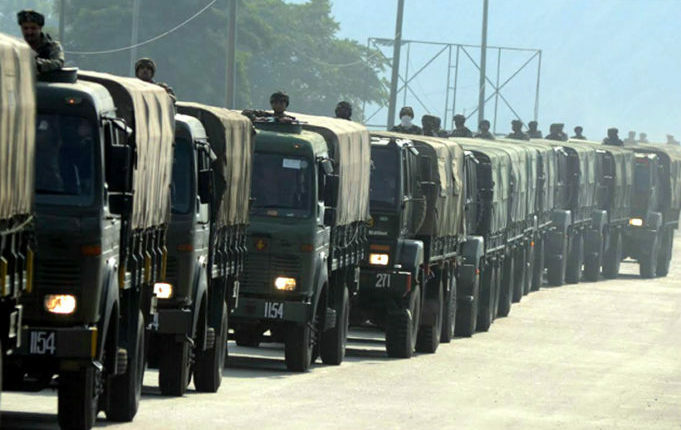 Rising Kashmir spoke to the ambulance driver Firdous Shah who confirmed the incident happened on April 10 (Wednesday), the day when the movement from Baramulla to Udhampur on the highway was prohibited. “The cancer patient had to be taken to Doda but we were several times stopped at check points till Banihal,” he said. Shah said near the Lower Munda turn on the Srinagar-Jammu highway, they were stopped for nearly 25 to 30 minutes. “The Magistrate was also deployed there but we were not allowed despite having the official permission,” he said. The patient Abdul Qayoom Banday of Doda, who had been admitted in SKIMS Soura for around five days, was being ferried in the ambulance to his home in Doda on April 10, his son Sheran Qayoom said. “The doctor discharged the patient and we were provided ambulance. We didn’t know about the highway restriction but knew that no one stops an ambulance,” he said. Sheran said they were stopped at least 50 times on the highway despite pleading that the patient was inside the ambulance. “The government forces opened the door of the ambulance and saw the patient inside. But we were allowed to go after only 25 minutes,” he said. Sheran said his father, who worked in agriculture department, died on way home. For two days in a week (Wednesday and Sunday), the government bans movement of civil traffic on the 270-km-long highway for smooth and safe passage of convoys of the paramilitary forces. Contingents of government forces and magistrates remain deployed at the intersections of the highway to restrict the civil traffic from venturing on the highway. However, the government had said medical emergency cases, schools, tourists, lawyers, business establishments on the highway, agricultural land and orchards, or any other spontaneous emergency cases were exempted from travel ban. The travel restriction has triggered criticism in the Valley as commuters are facing inconvenience.